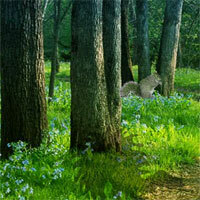 Extremely Squirrel Forest Escape is another new point and click live escape game from games2rule.com. In this game, you came to to see the beauty of a forest which is located outer of the city. But unfortunately, you missed the way out. You have to find the way to escape from there by finding useful objects, hints and solving puzzle. Click on the objects to interact with them and solve puzzles. Good Luck Have Fun! Good morning Alpha Omega. I know what you mean. I got into the habit of right clinking on the "Play this game" for all games so that a new tab will open. I am stuck. Anyone still here? Alpha you need a stick to knock some of the flowers down. They worked for me. Hi Jenny! SO far I'm enjoying this game. A bit of back and forth, but fun! Missing 1 orange gem and 1 green crystal. Thanks Alpha. Still missing one green crystal. Thank you Alpha! You've got good eyes! LOL, just found it Alpha. Now can't find last yellow flower. don't see any puzzles undone or anything missing anywhere. Out finally. forgot to get yellow flower from placing crystals. Found it! Forgot to do the squirrels! !